HP’s Spectre 13 was designed for tablet lovers who don’t buy tablets, It’s a lightweight though sturdy ultrabook designed with a powerful Intel 8th-generation Core chip inside and an eye toward the future. HP’s stylish Spectre offers excellent performance for an ultrabook at a good price, making this a recommended choice. At a light 2.4 pounds, though, the Spectre 13 is forced to make some compromises. It falls short of the “all-day” battery life that some demand, delivering about six hours in our tests. HP probably dialed down the display resolution to preserve battery life, too, so the Spectre includes a 1080p touchscreen display. The Spectre 13 also commits wholeheartedly to USB-C/Thunderbolt. You’ll need a dongle if you own older peripherals. iThe Spectre 13 sandwiches a decent stack of features between its slender panels. There's no discrete GPU, and the storage and battery are a bit spare, but Its 8th-gen Core CPU is the star. Note that HP also includes a range of options: up to a 1.8GHz Core i7-8550U (an additional $180), 16GB of memory ($70 more), up to a 1TB SSD ($370 additionally) and a 4K display (an additional $150). Whether open or closed, the Spectre 13’s elegance shines through. 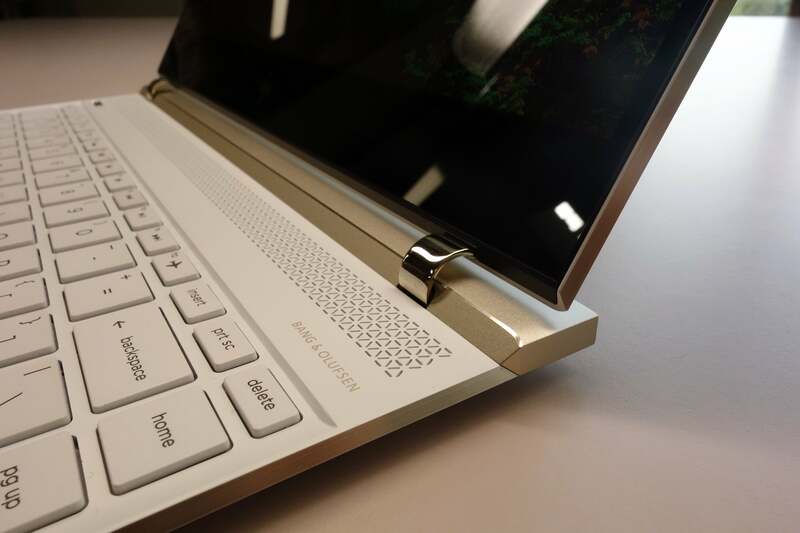 It’s a beautifully architected notebook PC, with metallic accents that complement the understated white of the chassis. (Normally, the Spectre 13 ships in black; the Ceramic White option our test machine included is an extra $10—and worth it.) Would I have chosen a series of circular holes to replace the hexagonal slits of the fan grille? Maybe. A narrow power button to one side also feels a bit out of place. But these are just nitpicks. 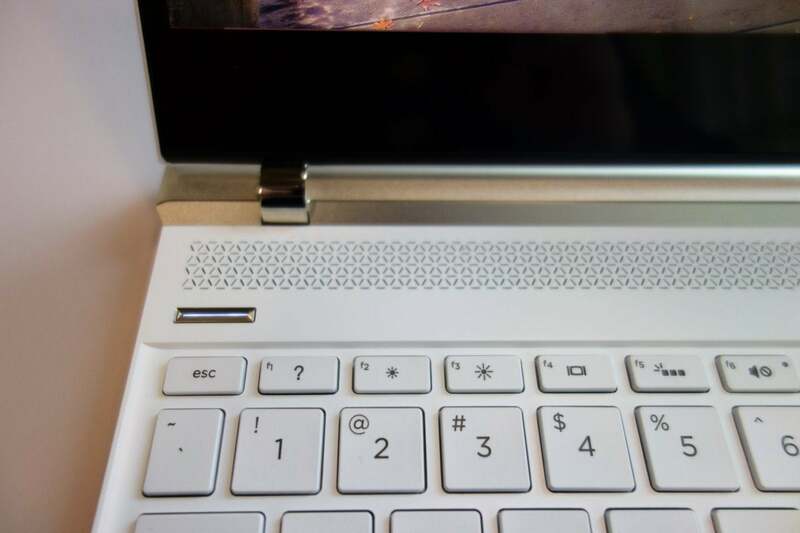 The Spectre Laptop 13’s hinge, which “floats” the display above the keyboard, is a stylish touch. Otherwise, though, the Spectre 13 inspired a round of admiring remarks as we opened it up. For some reason Apple is still held up as the model of aesthetic excellence within the computer industry, and the Spectre 13 proves.that adulation is misplaced. HP, at least, has passed it by. At 2.4 pounds, the Spectre 13 is light, yet solidly constructed. Many aspects reminded me, though of a tablet: its weight; the power-efficient, 1080p display; and the pair of silver hinges that conceal the I/O and electric connections, slightly lifting the display above the keyboard. 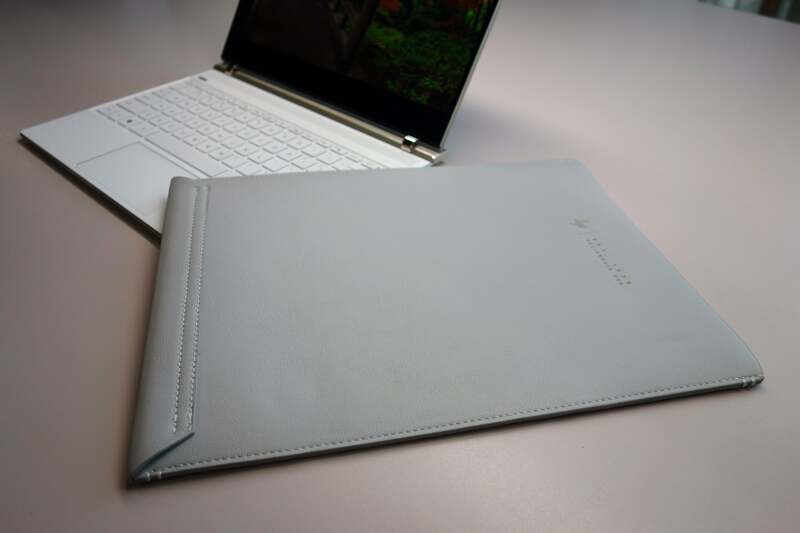 HP also includes a pleather laptop sleeve to protect the Spectre Laptop from nicks and scratches while in your bag. A laptop sleeve comes standard, HP says. The HP Spectre Laptop 13’s 1080p display pumps out 291 lumens, just above the 265 lumens or so that we normally consider ideal for average use. There’s no automatic brightness compensation, however, so you’ll need to dive into the Windows Settings menu to make any needed adjustments. About the only complaint I have about the display is the massive bottom bezel HP added too equalize the size of the display to the keyboard when closed. On one hand, it’s a jarring throwback to the laptops of the 1980s. On the other, it’s the mole that sets off the rest of the Spectre Laptop’s face. On the rear of the Spectre 13 sit three USB-C ports: a dedicated charging port, and two others that can either be used for charging (the Spectre itself, or external devices) as well as I/O. Placing them to the back of the laptop keeps the cords out of the way, including the 3.5mm headphone jack that the Spectre Laptop preserves. The power button looks like it could support a fingerprint reader, but doesn’t. Nearby sits the useless “help” (“?”) key. Why couldn’t it launch the Windows 10 “Tips” app? 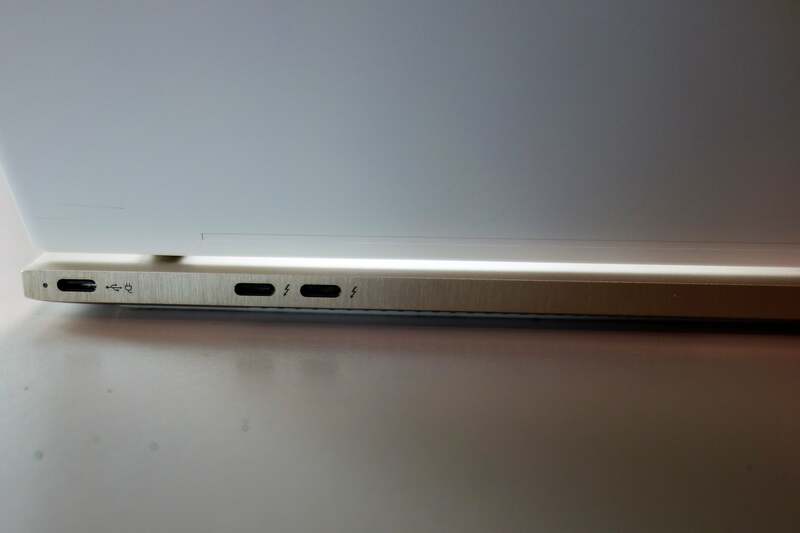 Importantly, two of the ports (marked with the appropriate logo) are Thunderbolt 3, meaning they're capable of transferring 40 Gbps data, including DisplayPort 1.2, and delivering and receiving power. The other, standalone charging port is a more generic USB-C port, capable of receiving power and transferring 5 Gbps, including DisplayPort. USB-C still remains a somewhat dicey proposition, if only because the standard still requires users to invest in dongles to connect older devices. What HP should have done is bridge the older I/O standards to the new by including dedicated USB-C adapters within the box. And it does so, somewhat, by bundling a USB-C to USB-A adapter in the version of the Spectre Laptop it ships to Best Buy. 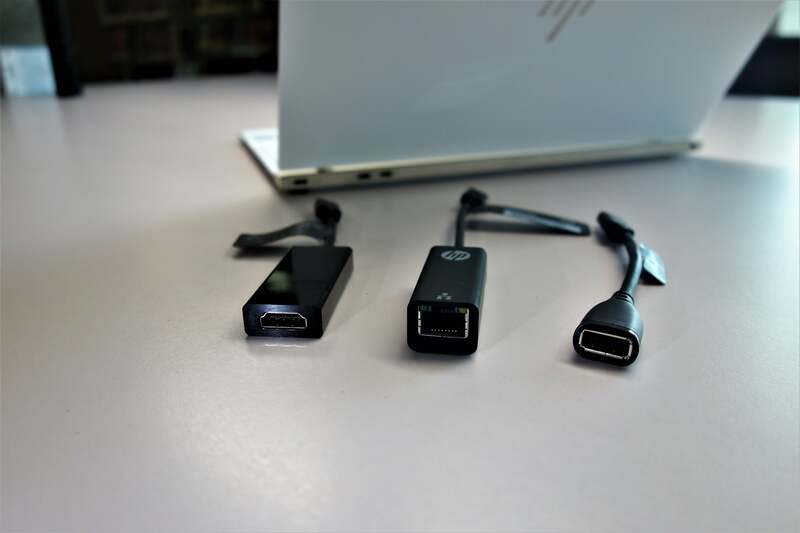 But HP’s shopping page for the Spectre fails to list either its $24 USB-C to HDMI 2.0 adapter or the $49 USB-C to ethernet adapter, proving that the company at least needs to put more thought into the experience. A trio of USB-C ports (and a headphone jack, not shown) are the Spectre Laptop 13’s only physical I/O ports. The two right-hand ports support the Thunderbolt high-speed I/O connection. The keyboard of the Spectre 13 feels of/8 tight and springy, but with shallower key travel than I’d normally prefer within a notebook. It feels like a tablet keyboard, though a bit roomier, spanning 11.5 inches from the left to the right-hand side of the keyboard. That’s about three-quarters of an inch wider than the Microsoft Surface Type Covers that I’ve used frequently, though each individual key still measures about 1.6 cm across—the wider keyboard provides a bit more space between keys, basically. The keyboard also has its quirks. A dedicated “?” key in the top row of function keys serves as a dedicated help button, but the only thing it does is launch Edge with a preprogrammed “how to get help in Windows 10” query. There’s no intelligence, no contextual awareness from app to app, rather shocking in an age where digital assistants try to learn so much about you. Why not just make it a dedicated Cortana key or launch the Windows 10 “Tips” app? Also, though the keyboard is backlit, a dedicated backlighting key toggles it on and off—always on, or always off, with no intensity gradations or gradual timeouts. 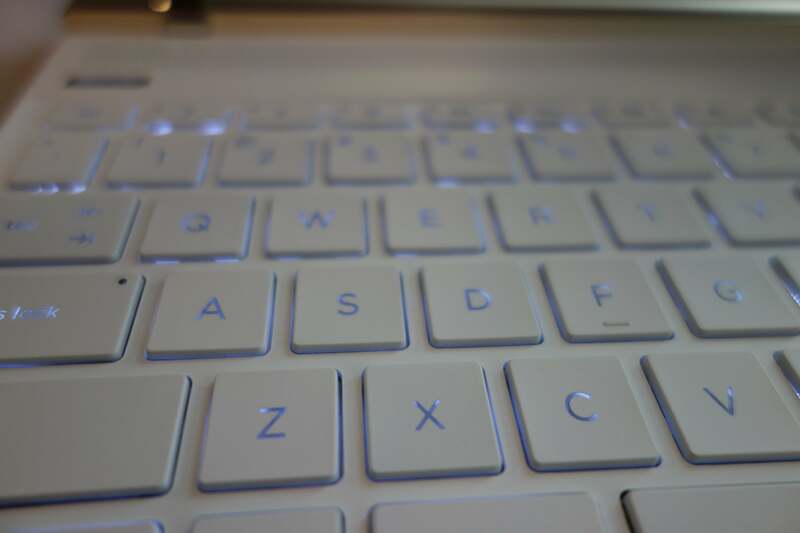 The keyboard’s backlighting is adequate, though it’s simply on and off. The narrow gap around the touchpad gives the impression that it was shoehorned in, though it felt smooth and responsive under my fingers. Gestures operated as you’d expect. The Spectre 13 pumps out an impressive amount of volume through its Bang & Olufsen certified speakers, with decent (for a laptop) bass and midrange. Adjusting the bass and treble using the Bang & Olufsen app’s audio controls does zilch, though, turning on Windows’ virtual 7.1 audio slightly improved the sound. In all, the Spectre’s speakers, mounted behind the keyboard, aren’t that bad. I did notice some speaker crackle crept in near the end of my review period, though. The Spectre 13 lacks a rear camera, though the grainy front-facing TrueVision HD IR camera includes Windows Hello biometric login capabilities which worked well. A pair of IR LED lights help illuminate your face. Our test unit shipped with three adapters for the Spectre Laptop 13, most of which you’ll have to buy yourself. HP includes a few extras, including its own HP JumpStart introduction to its services, and an HP ePrint app. Though Windows includes its own Windows Defender antivirus software, our machine also came with an activated copy of McAfee LiveSafe, an anti-malware, firewall and Internet protection app which normally costs $80 per year. Though the 8th-generation Core chip inside the HP Spectre 13 offers more capabilities than the prior 7th-generation chips, you’re probably not buying this laptop for performance alone. Still, the Laptop 13 is one of the first to include a so-called Kaby Lake Refresh chip, the very latest Intel processor at the time of this review, and it pays off. This 4-core, 8-thread chip boosts from 1.8GHz to 4.0GHz when under load, though the integrated graphics chip means that 3D performance suffers somewhat. Great performance in such a thin (0.4 in.) form factor is outstanding. Essentially, the Spectre 13 is best suited for office tasks, along with some light gaming and video playback. As we almost always do, we used this laptop as our work machine for several days, and also to write this review. At this point, the vast majority of machines can handle routine home and office tasks, including web browsing, Office work, and the like. I happened to have an even 30 tabs open in Google Chrome as I wrote this review, and I didn’t notice a smidge of slowdown—though when one browser tab sucked up all the available memory, the fan kicked in. 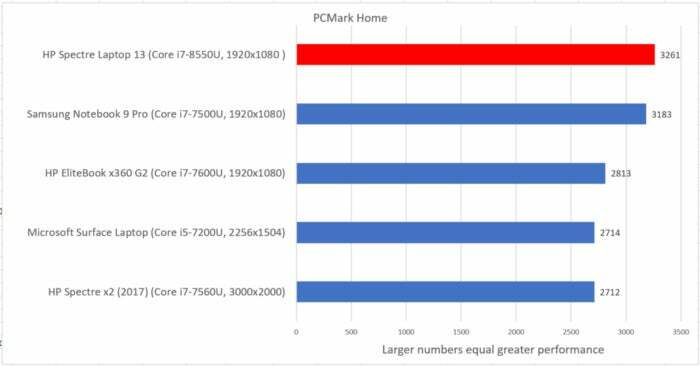 Here’s how the Spectre Laptop 13 stacks up against a variety of recent thin laptops we've tested. We start off strong with PCMark’s Work benchmark, which measures basic Microsoft Office-like spreadsheets and word-processing tasks. 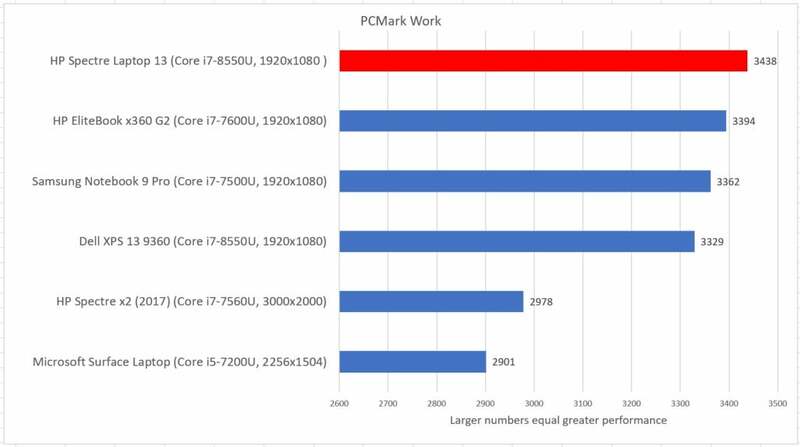 The PCMark benchmark measures office tasks, and its Kaby Lake-R chip propels the HP Spectre 13 to the top of the heap. 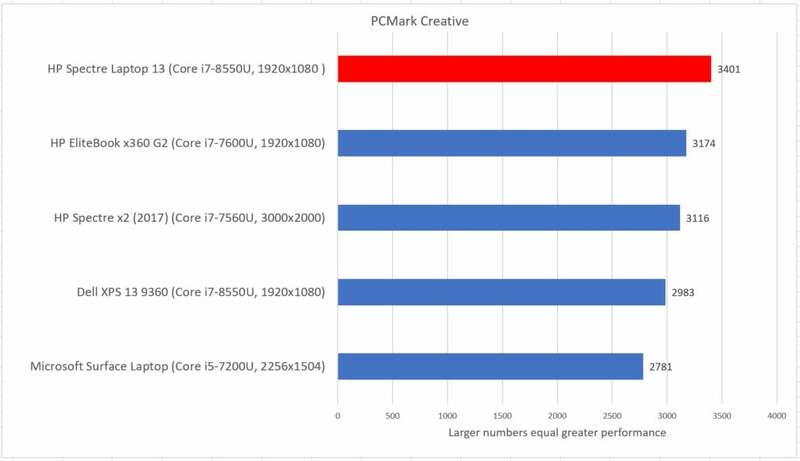 PCMark also measures Home and Creative tasks, including light gaming, photo and video editing, and the like. Once again, the Spectre 13 comes out ahead. You’ll have no problems with 2D sprite-based games like Terraria. Even basic 3D games like Minecraft ran absolutely smoothly. 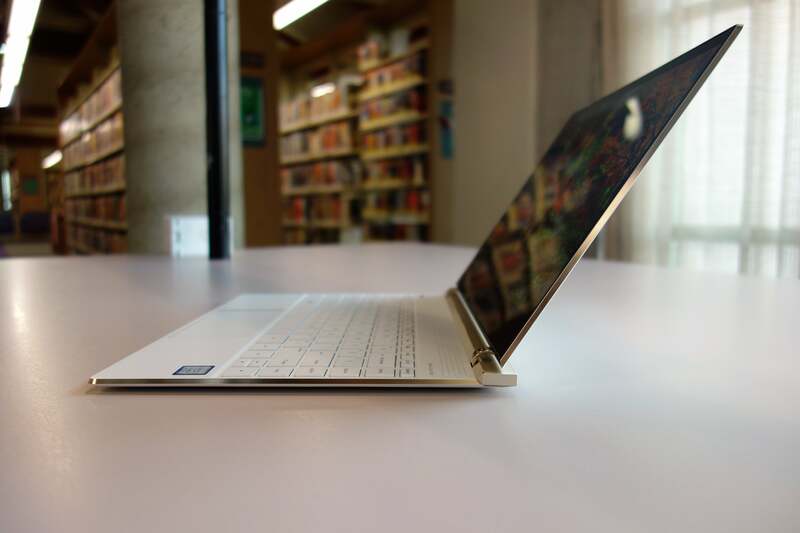 Again, the native performance of the HP Spectre 13 lifts it above all of the other recent ultrabooks and tablets we’ve tested. 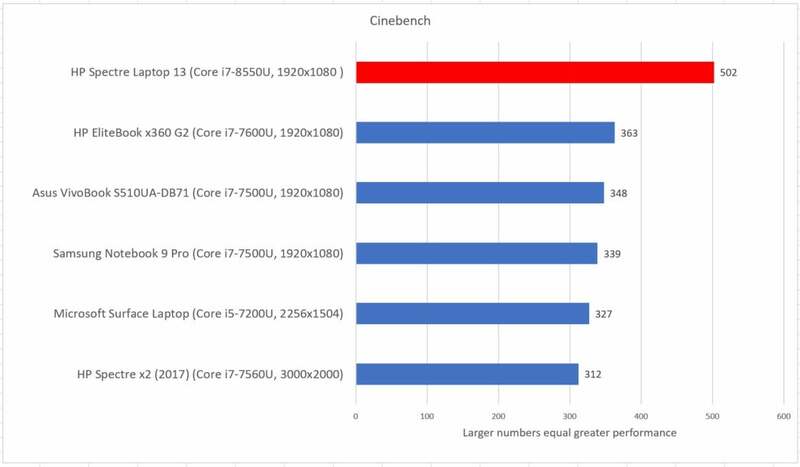 We also test laptops and tablets using the Maxon Cinebench benchmark, which renders a complex 2D scene using all of the available cores and threads. It’s a somewhat abstract test, but the results speak to how well the Spectre 13 processes visual tasks. Not only is the HP Spectre 13 on top, but its performance exceeds the others by a wide margin. A somewhat similar task uses HandBrake, an open-source tool which we use to convert a Hollywood movie into a lower-resolution format for Android tablets. 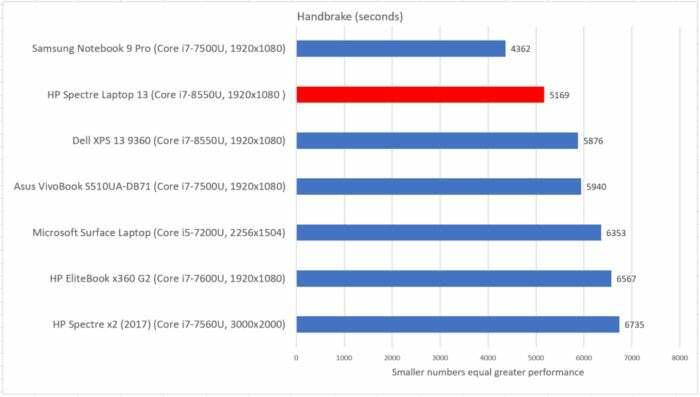 If you use the Spectre 13 for intensive processing tasks, this is another real-world example of how well HP’s laptop will fare. 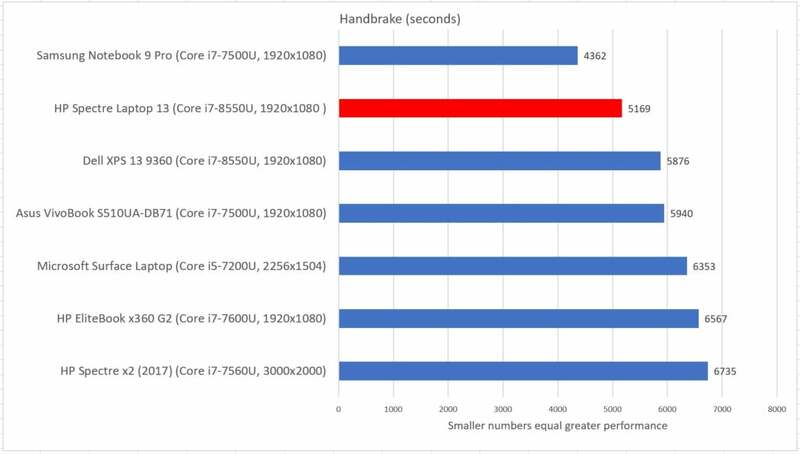 In our video conversion test using Handbrake, the HP Spectre Laptop 13 comes out close to the top. Finally, we also test using the 3DMark 3D graphics tests, which ask the laptop to render several scenes, which incorporate intensive 3D graphics, object physics, or both. In the real world, I like to run spot checks of how well the hardware plays some games I’ve accumulated over the years. Crysis 3, a seven-year-old top-tier first-person shooter, delivered about 27 frames per second at 1080p resolution and Ultimate settings, a bit too low to be playable. Surprisingly, that’s about the same frame rate that Paradox Interactive’s city builder Cities: Skylines played at, a bit more acceptable for a slower-paced game. A top-down 2D shooter, Neon Chrome, played at 60 frames per second (the maximum my monitor allowed) with no issues. Again, Minecraft looked as smooth as silk. I wouldn’t even consider trying a recent 3D shooter like Destiny 2 with the Spectre Laptop 13, however. Otherwise, though, the Spectre 13 fared somewhat average. One of the few tests where the HP Spectre Laptop didn’t perform all that well. 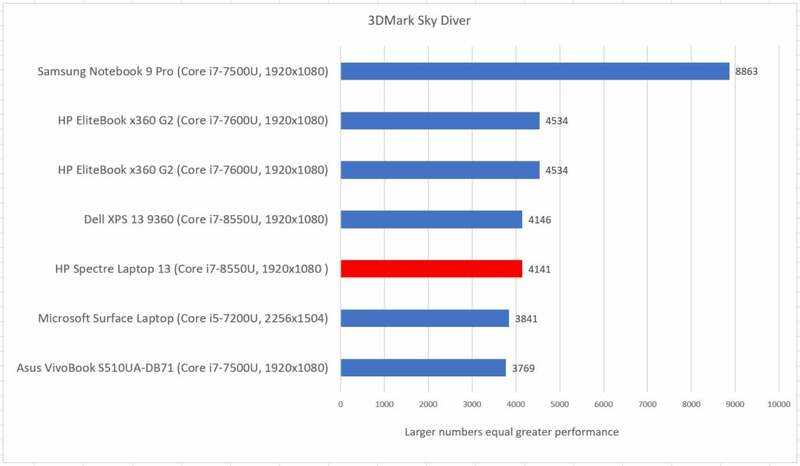 Look closer, though, and you’ll see that the upper tiers consist of the 7th-gen Core i7 chips, which performed just slightly better in 3D applications. The two 8th-gen ultrabooks are neck and neck. Finally, there’s battery life, always a key metric for a laptop or tablet. Again, I suspect that a larger, thicker laptop would have been capable of a higher-resolution display with longer battery life. 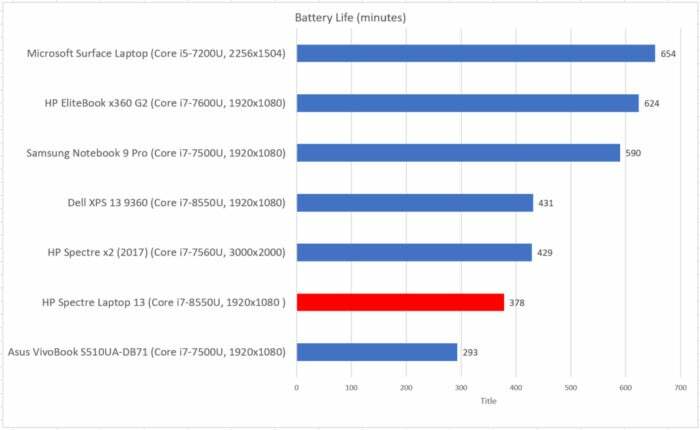 At over six hours, the Spectre Laptop’s 43 -watt-hour will last you about the length of a plane flight from San Francisco to New York, playing videos the whole way—which is how PCWorld.com measures battery life. But if you’re looking for a mobile device with superior battery life, look elsewhere. PCWorld loops a video continuously until the battery expires, with audio on and at what we consider to be a reasonable light intensity. Should you buy the HP Spectre 13? Not every notebook has to shoot for the stars. 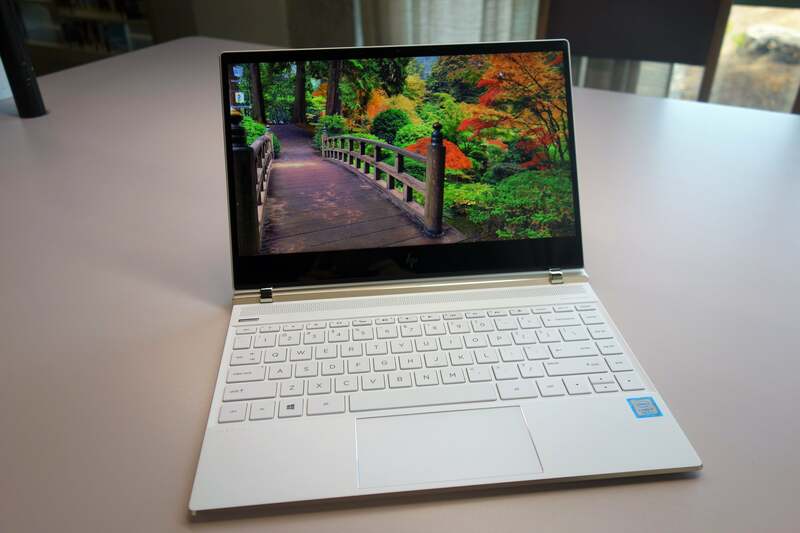 The HP Spectre 13 certainly delivers on weight and aesthetic appeal. 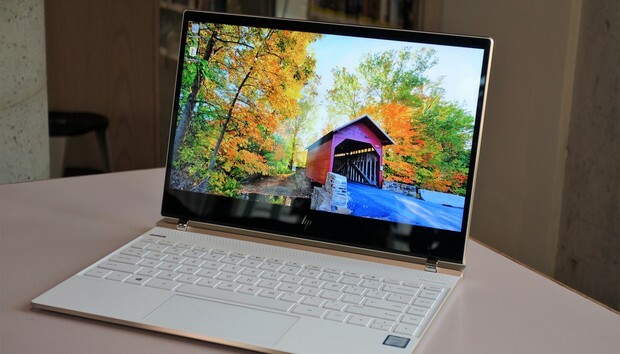 Though we obviously can’t speak to the long-term durability of the Spectre 13, this seems like a solidly performing ultrabook designed to address your needs both now and in the future.